← American Choppers TPB coming in November! Congratulations on all of your success. 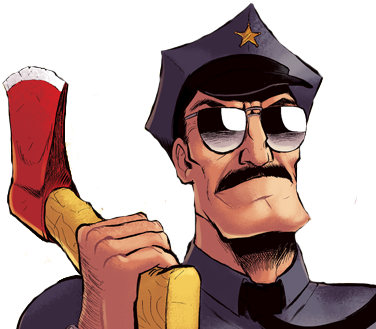 I hope we can still get more Axe Cop comics in the future, enough to fill another volume so that we can get this one in print! Does this mean that Axe Cop caused the Bearmageddon!? I had explained the basic plot of Bearmageddon to Malachai when he came up with this. In my notes Axe Cop gets the idea for a bear army when he reads Bearmageddon. I can’t read Axe Cop #3, because the archives don’t work! Trying to go to the beginning of the archives says “Page not found.” Trying to go to any of the later chapters just gives me the blog posts but not the comics. Yeah I just noticed how bad that was yesterday. I don’t know if it has always been that bad or if it just happened but it definitely needs fixing! For now, if you scroll down to the bottom of the Archives page there is a direct link to every single episode, so that might work for you in a pinch. Huh, I just noticed that character tags aren’t working correctly, either. The Characters page still has them all, but clicking an individual character usually goes to the error page now, except a few of them go to one old blog post if they’re mentioned in the post’s title. Ethan’s web guy, here. Thanks for pointing this out. I think a software update I performed recently had some bad side effects. I’m working on fixes. Thanks for pointing it out! PS: Ethan, please don’t let AC chop my head off. 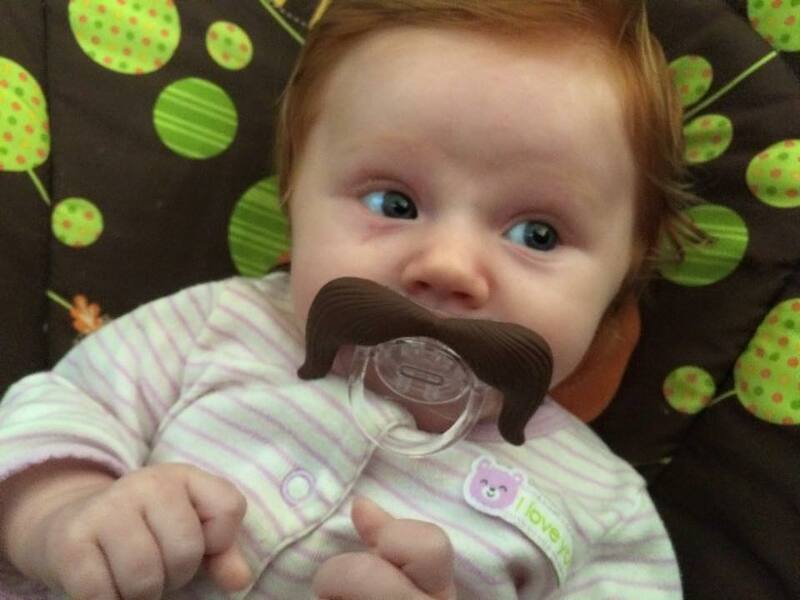 Congrats on your adorable new baby girl. 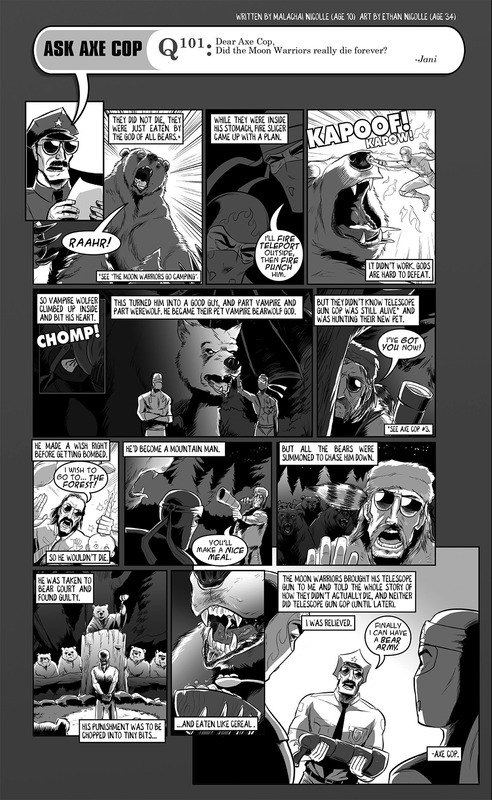 This is hilarious–love the bear court and the punishment of being eaten like cereal. Wow, this is the greatest moment in Axe Cop’s history ever, the moon warriors being alive as I have feeling I have a feeling they’ll team up with axe cop again on his next adventure yet to be written by your talented storytelling bro: Malachai, and congratulations on your newborn baby, Ethan, you’re a lucky Family Guy, a real Family Guy of course, not the Cartoon sitcom about Peter Griffin. By the way Eef, has malachai taken some interest in some manga or anime that could play an influential role on Axe Cop’s next adventure yet to be? Congratulations on all counts! I can’t believe it’s been five years. Argh there’s two of you now lol. Congratulations Eef! 5 years later and Axe Cop is still disturbingly gory and hilarious at the same time. Keep on being awesome. five wonderfull exciting years !!! Nothing, literally nothing, gives me a hearty belly laugh like a new Axe Cop episode. I’m on the road to becoming a Conservation Officer, so the idea of a potential poacher getting condemned by the Bear Court to death by eaten-like-cereal brings great satisfaction. Little Eliza Jean Nicolle ,best wishes to you always.loved your way you present this ethan. I would love to see some more such interesting article from your side. Am I to understand correctly that I won’t be able to see any new episodes of the Axe Cop TV series if I don’t have cable? If true, that’s a bummer, since previously they were shown in the evenings on the broadcast network. I’m not sure if they will air on FOX or not. I don’t know if FOX is totally ditching ADHD. But they will probably be available for free on ADHD.com like the others were, and on Hulu for free. They made the show pretty easy to watch for free in season 1. I assume they will do the same for season 2. Foxadhd.com doesn’t seem to have updated in quite a while, but Hulu has put up almost all the episodes of The Lucas Brothers Moving Company and Stone Quackers by now, so I would keep checking Hulu the month after new episodes air. If you like any of the shorts at all, the FOXADHD Youtube channel looks like the place to find all of them except the Axe Cop XBox One ad. a few questions: do you like your tv show self? and finally, would you use the good guy machine to turn jason voorhees good and make him part of your team? why? he cant die without being disintagrated into non existnece, can kill bad guys really easy, and is just really powerful in genaral? Dear Axe Cop, why do people find you amusing? Your show was the epitome of deadpan. You comic is the reason why children should be outside staring at the sun and not trying to contribute to society. Cancer is funnier than you. Seriously, every other web comic I have read has at least made me chuckle at least once. I hope that all the jaded stoners with extra chromosomes, that you call fans, are made sterile by your lackluster storytelling and slightly off-white sense of humor. Please stop making these “comics.” You are obviously sating yourself with some sentiment of smug self-satisfaction by producing these, and that is morally wrong. You should be ashamed of yourself for prostituting such a dismal product to the American people. Please die. Hey, Axe Cop, why is a raven like a writing desk?